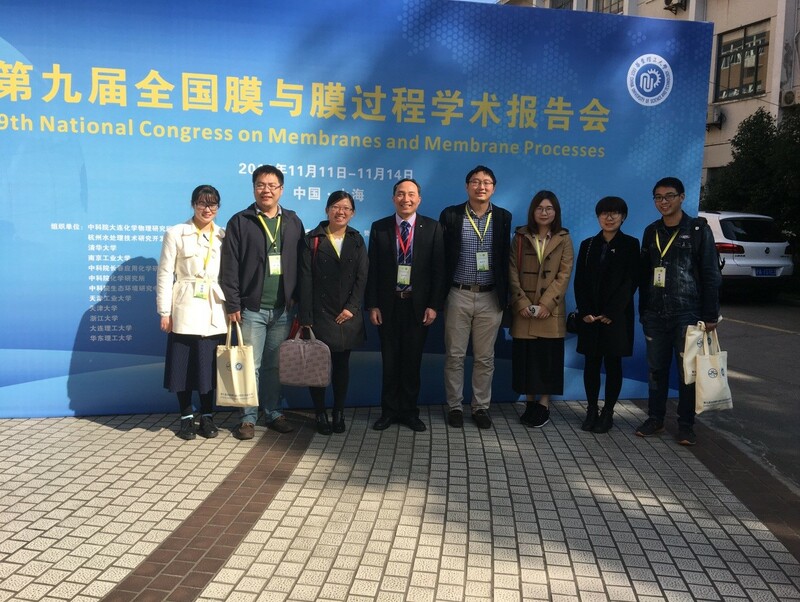 During November 11-14, Prof. Jin and his students attended “9th National Congress on Membranes and Membrane Processes” in Shanghai. Prof. Jin gave a plenary lecture titled “Design, Fabrication, and Application of Inorganic-organic Composite Membranes (有机无机复合膜的设计、制备与应用)”. Dr. Jing Zhao and Zhenyu Chu gave oral reports on “Overcoming of Trade-off Effect via Manipulating Membrane Interface (基于膜界面调控克服trade-off效应制约)” and “A Novel Membrane with Heterogeneously Functionalized Nanocrystal Layers Performing Blood Separation and Sensing Synchronously (一种新型的用于血液同步分离与检测的分离传感膜)”, respectively. Students Qianqian Li, Yufan Ji, Mengchen Zhang, and Yukai Li gave their oral presentations of “A MOF/CS Mixed Martric Membrane for Dehydration via Pervaporation (一种壳聚糖MOF杂化膜用于渗透汽化)”, “The Fabrication of the Ultrathin PDMS Membrane Based on Cu(OH)2 Nanostrands (聚二甲基硅氧烷氢氧化铜纳米纤维复合膜的制备及气体分离性能研究)”, “Inner Surface Graphene Oxide/Ceramic Tube Composite Membranes for Efficient Water Purification (氧化石墨烯陶瓷管式膜内膜用于水处理)” and “Preparation and Characterization of PEBA/ Ceramic Hollow Fiber Composite Membrane (聚醚共聚酰胺陶瓷中空纤维复合膜的制备及应用)”, respectively.